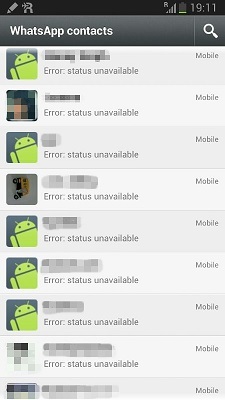 Yesterday, the users of highly popular free messaging and file sharing application WhatsApp noticed a users' status message which read, "Error: Status unavailable". If you are one of them, who completely trust the highly popular free messaging and file sharing application WhatsApp, you would have come across a peculiar problem today. The users' status message is being displayed as ''Error: Status unavailable''. The problem, which seems to have started a few hours ago has created a lot of panic. The 'hoax messages' seem to have infuriated users all the more. ''This Whatsapp chain message is more annoying than all those forward mails of 2004-7 put together!,'' tweets a frustrated user. ''guys... dont be so gullible... the whatsapp chain message is a stupid hoax,'' tweets another.